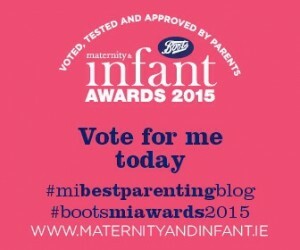 I am a finalist in the Boots Maternity and Infant Awards in the Best Parenting Blog category. I am obviously delighted but need your help. There is a voting process. I would be beyond thrilled if you took two minutes to give Learner Mama a vote. Just click on the image below and scroll down through the categories to find Best Parenting Blog. It is in the “For the Family” section. I’m there in the list; Lucy O’Connor – Learner Mama.